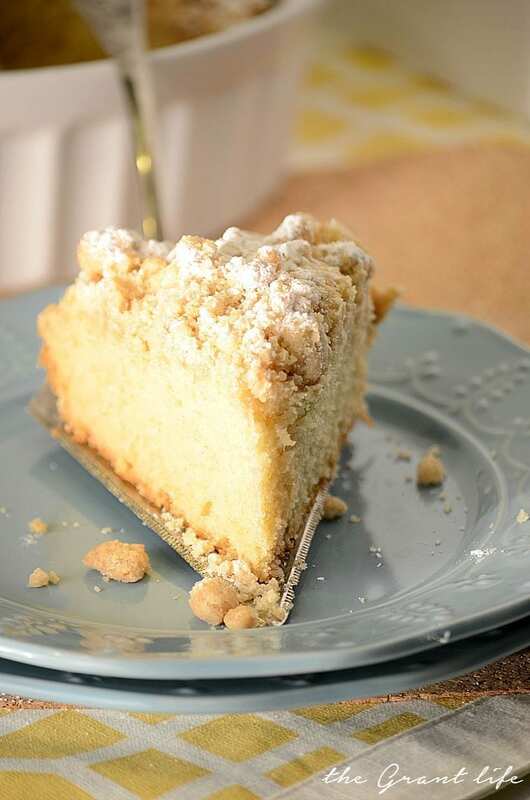 This New York style coffee cake is best served with a cup of coffee and glass of milk. Oh my gosh. I don’t even know where to start. Deep breath. Ok. Wooosaw. A month ago (ONE MONTH!) we took in a stray dog that was hanging outside out house. She was super cute and fit in well with the other dogs. She had a bad hip and we took her to the vet to have it checked out. After doing an x-ray the vet said she would probably need surgery because it was so bad. Ok. We can do that. Surgery scheduled. Shots given. Going on with our happy little life. I took her to the vet to have her surgery and one of the assistants commented that she was kind of pudgy. I said yea, she was a stray and has been eating a lot but my husband thinks she might be pregnant. Everyone looked at her and shook their heads yes. Yes, she is pregnant. WHAT THE WHAT! No. No. She has just been eating really, really, really well. The receptionists kind of snickered (not in a mean way) when I walked out with Penny. (The pregnant stray with a bum hip.) They didn’t feel comfortable doing surgery on her since she was with puppy. Or puppies. We didn’t know how many or what kind at this point. Oh and I had to carry the dog out because she doesn’t like the leash. They may have been laughing at that too. I should have taken a video of my poor little pup with a bum hip and huge belly. When I let her out she would venture off a bit and then come running back in. Running. On 3 legs and with her belly swinging from side to side. It was super cute. And then 10 days after our faithful vet visit, she had her puppies. I came home to one in the hallway looking for its momma. I picked it up and put it back with momma. I looked in her little nook area (she had created a little nest in the bottom linen closet the day before) and there were 2 more babies. Three! She had three puppies! Oh how silly of me to think she was done. Her belly was HUGE and the puppies were so small. Yall. Sit down. And don’t have any sort of drink or beverage in your mouth. Because she had EIGHT puppies. EIGHT! (Sorry if you spit out your coffee. I totally understand.) The kids and I even got to watch one being born. Whatever you drink with this New York style coffee cake you are in a for a treat. 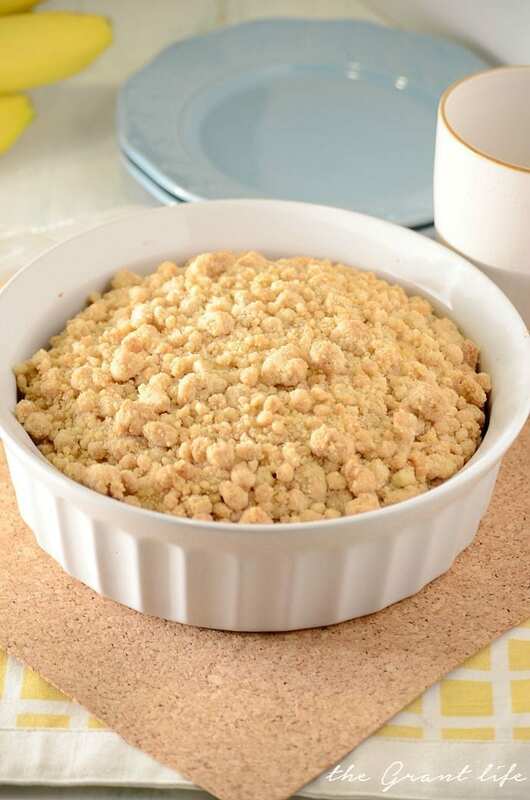 The crumb topping is oh so delicious and the cake itself is super moist. It’s worthy of your finest coffee or your best whiskey if your dog just had 8 puppies. EIGHT! Preheat oven to 325. Line a baking dish with foil, allowing it to overlap. Lightly spray the foil with cooking spray. Mix the flour, sugar, baking soda and salt until combined in a stand mixer or with a handheld. Add the buttermilk, egg, yolk and vanilla until light and fluffy. Scrap the bowl as needed. 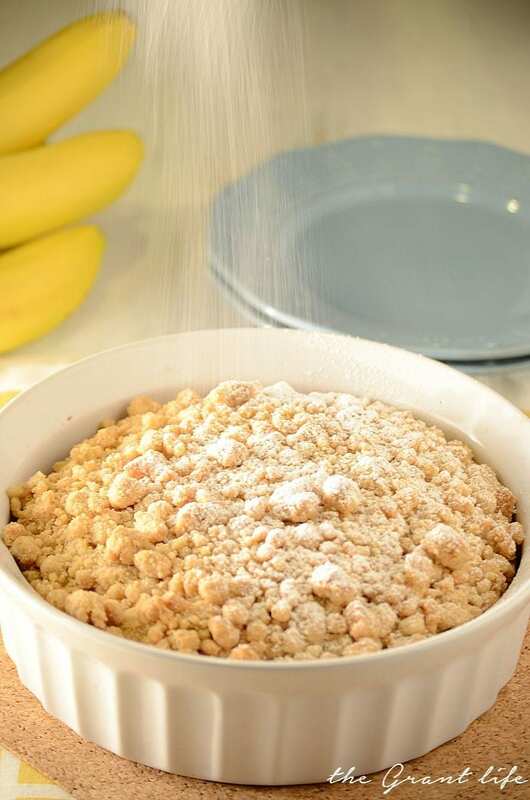 Prepare the crumb topping by mixing the melted butter, sugar, brown sugar, cinnamon and salt. Slowly add the flour until a sort of dough forms. 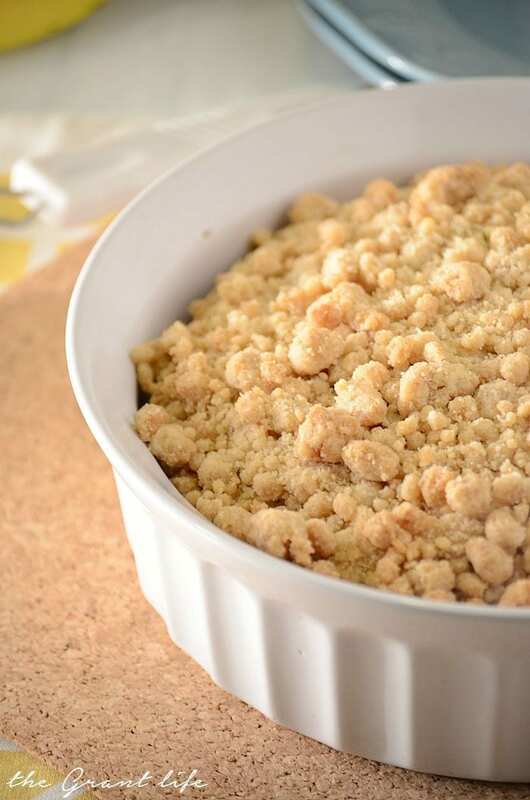 Take the crumble and using your hands bread up the pieces over the cake batter. Make them about pea size and spread them evenly over the cake. Bake for 35- 40 minutes or until crumbs are slightly browned and center comes out clean. Rotate the pan halfway through cooking. Allow to cool on a wire rack and dust with powdered sugar before serving. And sign up for our recipe updates! I’ll send new recipes plus stories about our life right to your inbox! This looks so seriously amazing! 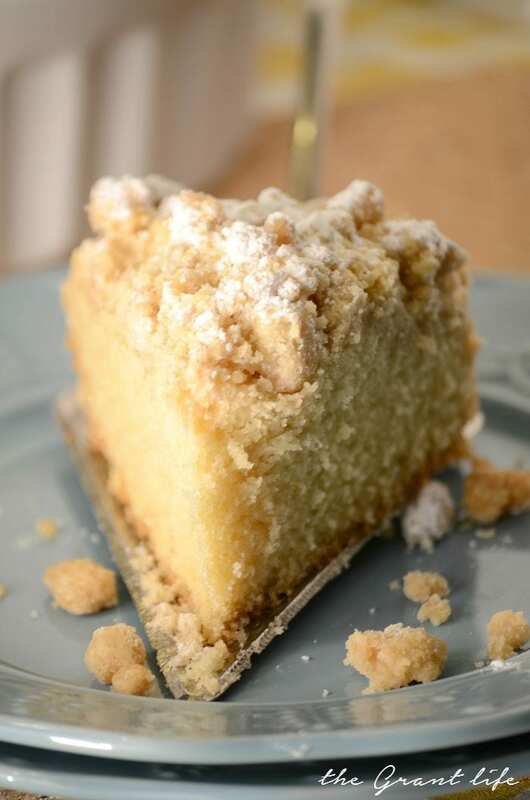 That crumb topping just makes this cake. Pinning! Oh my gosh! As they say, no good deed goes unpunished! Enjoy those shots girl, you need them! 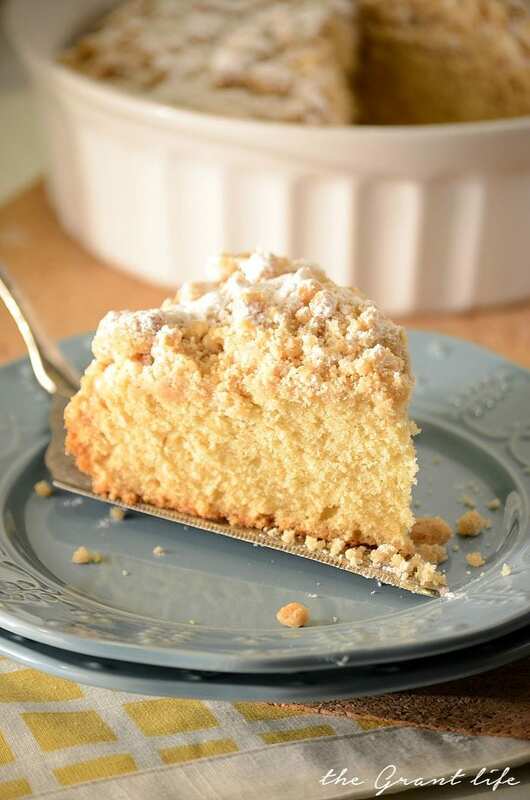 🙂 My Mom makes a similar coffee cake to this but I can’t get her to cough up her secret recipe…. need to give this a shot! Eight puppies! Holy cow! Yes, I would need a piece of this yummy cake after that! RIGHT?! Gah. I still can’t believe it! Oh my gosh!!! Ship a puppy to Illinois and some coffee cake 🙂 How exciting for you and your kids, but I am sure it will be hard to see the puppies go! You don’t have to tell my twice. Puppy and coffee cake going your way! Omg puppies! So exciting! But so much work! This is my most favorite cake ever! I want a piece! Great. You’ll take 2 puppies with a slice of cake. One the way. This looks SO SO good! Can I please send some my way! YUM! YES! 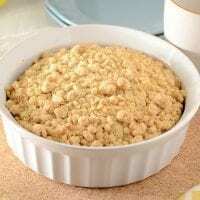 Sending you virtual coffee cake! I used an 8 inch round baking dish. Thanks Teresa! Coffee cake is my love! It’s perfect for breakfast and dessert….yum! It’s been crazy for sure! haha. Hope you enjoy Crystal! I remember you finding that stray but never saw this coming! I think you are in for at least four dogs now… Enjoy them while they are cute and the mom does most of the work. I hope you don’t have a hard time finding homes for them! PS I love this coffee cake! I didn’t see it coming either! I just thought she was eating REALLY well! Ahh well. I’m just destined to be the crazy dog lady. Going to try this just because of your story. We had 2 stray dogs and a third one showed up. A beautiful, fat Chocolate Lab. We too took her to the vet only to find out she was pregnant. When the time came, she got stuck in labor after having 6 puppies. We had to take her, at night, in labor, with her 6 puppies to an emergency animal hospital 45 miles away. There she had the rest of the litter. Went home with 9 puppies. All were full Chocolate Labs. We found great homes for all of them. Free to the new families. We are $3000 poorer because of it. Will dedicate this dish to people like us who love these little stray, pregnant pups! Pure labs! How awesome that you found them all good homes! We found six of the eight good homes and kept two. I hope you enjoy the coffee cake! I should make it too because my mom called me this morning and said my dad found a stray. It’s a boy though so no puppies but that will be 5 dogs for her!